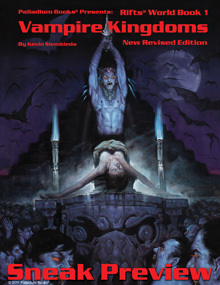 Rifts® Vampire Kingdoms is in final production and will be released in August, but in the meantime, head on over to DriveThruRPG.com and grab the Sneak Preview! It includes the front cover, Doc Reid's notes on the vampire menace, details on the process of staking vampires, and lists of vampire powers and weaknesses. Plus some breathtaking art by Erik Gist and Nick Bradshaw!